We require a minimum deposit of one third of the purchase price, which we will retain until delivery is complete. The two-thirds balance is due upon delivery in the form of cash, cashier’s check or money order. In the case of partial deliveries, we require the balance to be paid on the item(s) that you are receiving with a deposit remaining on the undelivered item(s). Grant’s is not bound by limiting endorsements on checks. In case of a pricing error or misquote, you may cancel the order or pay the corrected sales price. In case of math error, you agree to pay the corrected amount. Availability of special order merchandise is not guaranteed. We will be happy to furnish you with estimated delivery dates, however they are just estimates. We have no control over delivery schedule changes made by the factories or over the accuracy of information furnished to us by factories. Once your special order merchandise is ordered, your deposit becomes non-refundable and non-transferable. If for any reason the goods are no longer available, we assume no liability and will refund your deposit. Additional pieces purchased at a later date are subject to availability from the manufacturer. In addition, the manufacturer cannot guarantee that the dye lot on upholstered goods or the stain on case goods will match your original purchased goods. You are responsible for measuring to be sure merchandise will fit through doorways, stairways, into elevators, etc. We request that you accept delivery or pick-up your merchandise within 10 days of being notified of its availability, unless otherwise stated on the front of this contract. If this is not convenient or you are having a problem of any kind, please give us a call. However, if we do not hear from you, we may release the merchandise from you order(s) and it will be necessary for you to contact us to make other arrangements. Any change of address, phone number, etc., should be communicated to us. To prepare for the delivery of your merchandise, you must do the following: 1) Ensure that someone 18 years of age or older is home to accept delivery. 2) Remove snow or any other obstacles that might hinder our delivery crew. 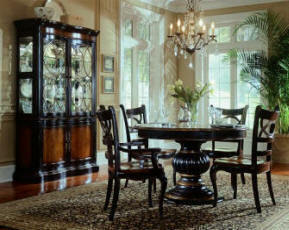 3) Clear the room(s) where your new furniture will be placed. Drivers cannot move or remove existing furnishings that are not listed on the delivery documents. This includes, but not limited to, electronic components (e.g. televisions, computers, stereos) 4) You are responsible for removing doors, if needed, to facilitate delivery. If a delivery requires the removal of a window, you will need to make arrangements and pay for it on your own. 5) Deliveries made above the first floor without access to an elevator will be subject to an additional charge. 6) It is your responsibility to report to us any special delivery conditions. 7) To ensure the safety of our drivers, we will determine if they will make deliveries during hazardous weather conditions. 8) If you are not at home or for any reason miss the scheduled delivery, we will reschedule a second delivery and you will have to pay an additional delivery charge. Article 4: Customer Pick-Ups REQUIRE AN APPOINTMENT, YOU CAN NOT JUST SHOW UP AT THE SHOWROOM OR WAREHOUSE. If the customer is picking up clearance merchandise we do not offer any special crating or packaging. Grant’s is unable to accept responsibility for any damage that has not been noted on the Bill of Lading or any damage reported to us more than 48 hours after delivery for UPS or FedEx shipments. Please verify that the correct item and number of cartons have been delivered, and inspect your furniture carefully while the delivery person is still at your home, before signing the Bill of Lading. Your signature is your acknowledgment that your merchandise is satisfactory and is in order. Any claim of damage that is not noted on the Bill of Lading is your responsibility. Valid damage claims will be resolved by repair or replacement of the item, at the discretion of Grant’s. Please allow Grant’s adequate time to evaluate and resolve the problem. Any legal disputes resulting in damages, from failure to comply with our detailed delivery instructions will result in a court action against you. We warrant that all merchandise meets manufacturer’s warranty standards. Manufacturers warranty information is printed on the hang tags that arrive with your furniture. Warranty begins when we receive merchandise. There is no warranty on clearance merchandise. All refunds must be accompanied by original sales order receipt. There will be no refunds on merchandise that has been accepted by the customer. In the event that merchandise we deliver has a defect, we will inspect the furniture in your home and repair or replace at our discretion. This agreement is binding on these terms as soon as you sign. If you cancel, Grant’s will retain one third of the purchase price. Clearance merchandise includes floor models, goods that are discontinued, and goods with some irregularity. Made in USA. Since 1924. If you’ve given up thinking you can buy new furniture that’s designed and made in America, think again. Stanley Furniture has been made in the USA since 1924. Approximately two-thirds of their revenues come from products made in their factories by their own craftsmen in Virginia and North Carolina. On a personal note, The Grant Family would like to remind you that not all furniture is created equal. Take some time to educate yourself on furniture construction and materials used. We strive to bring you quality brand names, but not all brand names are what they use to be. Most furniture manufacturing plants in North Carolina belonging to some of the most prestigious brand names are long closed and forgotten. Look for Made in the USA items for a lifetime of use. Traditional European silhouettes with a distinctive Italian heritage are lightly distressed with bold arches, handsome columns and octagonal fluting. Distinguished by swirly ash burl with a frosted almond finish, features dusted matte pewter hardware reminiscent of Renaissance jewelry. 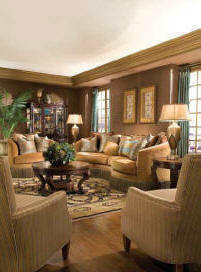 Accents of hand forged metal and St. Laurent marble, sumptuous velvet and rich damask complement its affluent heritage. Queen Sleigh Bed $ 299. Grant's Furniture and Interiors, FurnitureAve.com © Copyright 2009. All rights reserved.